As many as ten persons have been said to have been burnt beyond recognition after a fuel tanker exploded in Gombe. We reported earlier that a fuel tanker had exploded in Gombe state, causing some commotion in the place. 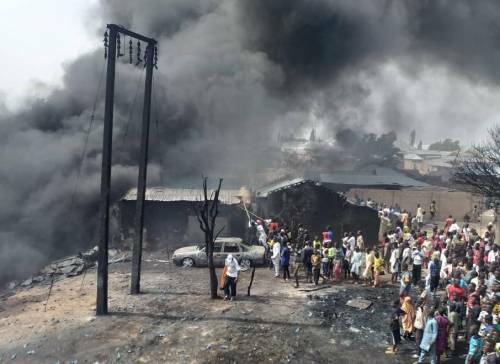 Now, it has been reported that at least 10 people have been killed, with several cars burnt after the incident which happened at Bomala Bridge axis of Gombe, capital of Gombe, on Saturday afternoon. A witness told SaharaRepporters that petrol-laden tanker collided with a truck carrying bottled water along Gombe southern bypass. He said more than 10 charred bodies were evacuated from the scene by personnel of the Nigerian Red Cross Society. As of the time of filing in the report, officials of the Gombe State Fire Service were still trying to put out the fire.